Think of your sheets like the wardrobe for your bed. It should reflect your style just as much as your clothes do. Make a confident and glamorous statement about yourself with all the refined elegance you want, and all the ease and convenience you need. 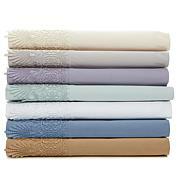 This soft sheet set is machine washable so you can finally have the sophistication you crave and easily care for it. There's also a generous application of Parisian style lace so you can live your life in high style. They washed and dried nicely. I babyed the lace on the top sheet and the pillowcases. I did not have to iron them. Would be perfect width on the top sheet if you added 6 inches to the width. My husband said the sheets were cold. I did not think they were. Be nice if you had a couple stronger blue colors. I give them a 5 star rating. I purchased the soft pink. After washing them, they are even softer. The lace did not bunch up. It still lays flat. The color is true to the pictures. 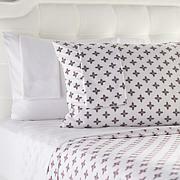 These sheets are lovely. I was nervous about how the lace would stand up in the wash, but these came out beautifully. Nice thread count, comfortable to sleep on. 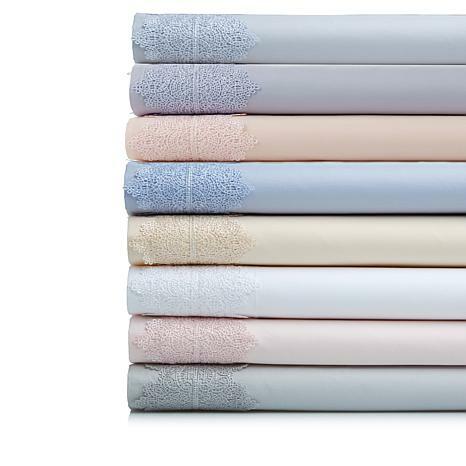 I highly recommend this set if you're seeking a nice affordable lace sheet set. I bought the white, and it's a true blue-based cool white. Very nice. Remind me about Highgate Manor upcoming shows.